AGATHA WAS ADOPTED AUGUST 17, 2008! When Agatha was surrendered to the shelter, the huband brought her in. His wife no longer wanted her. The husband did not even know the cat's name or age. So she was named Agatha and she is estimated to be around two years old. Agatha sat in the shelter for two months before she was adopted. Three weeks later she was returned. The family said she was a wonderfully sweet cat but it turned out their daughter was allergic. We felt so bad for Agatha having to sit in the shelter again that we brought her into one of our foster homes in hopes if getting her into a proper permanent home a little faster. 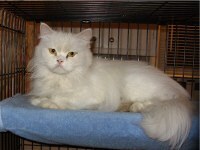 While at the shelter, the staff said Agatha was so neat and tidy, she never messed up her cage like the other cats do. Sure enough, now in a much larger cage with a perching shelf and a window to look out of, Agatha does keep her space in good order. When she first came into foster care, all of the dogs hovered around her cage. She didn't seem to care at all and proceeded to have a bite to eat. Agatha has been spayed, vaccinated, microchipped and tested negative for feline AIDS and leukemia. She did have a very bad case of ear mites which has been treated. She weighs just a little over 6 pounds.